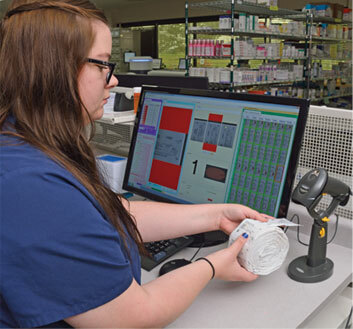 All long term care pharmacies are able to dispense the same oral solid and OTC medications. It is In Touch Pharmaceuticals innovation and technology driven pharmacy that sets us apart from everyone else. We pioneered short-cycle solutions in 2004, with the aim from inception to reduce medication pass error and we have improved our technology frequently to improve our processes. Our 7-day short-cycle solution has proven to be effective in reducing med error, waste, med pass time and the re-hospitalization of patients. When you partner with In Touch Pharmaceuticals, you become part of our family of pharmacists, technicians, customer service professionals, and an owner who gives his commitment to provide the best pharmaceutical care. We’re here when you need and available to you 24 hours a day, 7 days a week. For many years we have individually packaged doses, labeled them with the patient’s name, dosage amount and time of administration. Today, we surpass all quality standards.